These Cranberry Shortbread Bars consist of two layers of buttery brown sugar shortbread sandwiched together with a homemade cranberry sauce. When you first make these bars you will notice a real contrast between the tartness of the cranberry filling and the crisp, buttery sweet shortbread. But after storing these Bars in the refrigerator for a couple of days, the sharpness of the cranberries softens and blends with the flavor of the shortbread. This is another great recipe to make during the Holiday Season. Fresh cranberries are with us for such a short time each Fall and then they are gone. For this very reason you may want to buy a few extra bags to freeze so you can make these Cranberry Shortbread Bars other times of the year. Fresh cranberries have a tart, or should I say sour, flavor that pairs well with sweet ingredients. Since cranberries are never eaten raw, to make the cranberry filling we first cook them with sugar and a little water. If you have ever made cranberry sauce than this recipe will look familiar. The only difference is that we are using less water as we want the filling to be thick and syrupy. Cranberry Shortbread Bars: Preheat your oven to 350 degrees F (180 degrees C) and place the oven rack in the center of the oven. Butter (or spray with a non stick cooking spray) a 9 inch (23 cm) square baking pan. Cranberry Filling: Put the cranberries, sugar, and water in a medium sized saucepan. Place over medium high heat and, stirring occasionally, bring just to a boil. Continue to gently boil until the cranberries soften and the juices becomes thick and syrupy, about 5 minutes. Remove from heat and let cool while you make the shortbread. Shortbreads: In a separate bowl whisk the flour with the salt. In the bowl of your electric stand mixer, fitted with the paddle attachment (or with a hand mixer), beat the butter until smooth. Add the sugar and vanilla extract and beat, on medium low speed, until creamy and smooth. Add the flour mixture and beat just until incorporated and you have clumps of batter (not a solid ball of dough). Evenly press about two-thirds (370 grams) of the shortbread onto the bottom of the prepared pan. Lightly prick with the tines of a fork. Bake the shortbread about 17 - 18 minutes or until lightly brown. 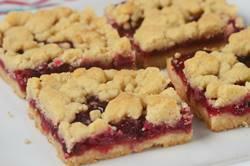 Remove from oven and evenly spread the cranberry filling over the shortbread base, leaving a 1/4 inch (.5 cm) border. With the remaining shortbread dough, using your fingers, crumble it over the top of the cranberry filling. Then lightly press the dough into the filling. Bake for about 25 - 30 minutes, or until golden brown on top. Remove from oven, place on a wire rack, and while still warm, cut into 16 squares. Allow to cool completely in pan. The bars can be covered and stored in the refrigerator for about five days, or they can be frozen. Makes about 16 Shortbread Bars.